Political shocks have market consequences. 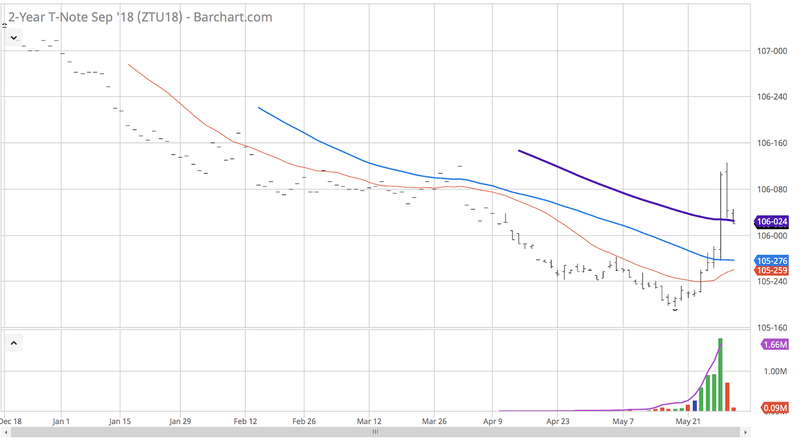 An examination of current financial markets against simple trend and momentum indicators suggests that the trading around the Italian political news was not pretty for systematic trend-followers. In the US bond markets, prices have rallied through 20, 40, and 80-day moving averages in just a few trading dates. This same pattern can be seen in Europe. 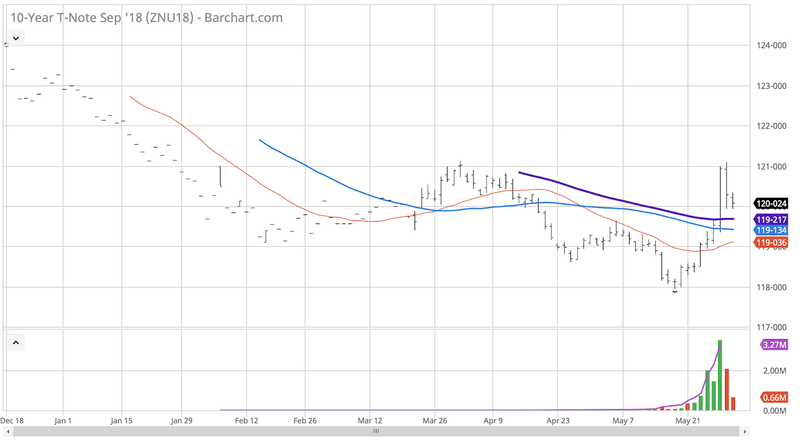 Short-term rate changes like the Fed Funds and Eurodollars futures one year out have shown an even more exaggerated pattern on a relative basis. It reversed the major themes in financial markets. It created a global contagion regardless of what some may have said by many pundits. It is not a crisis, but has generated an adjustment in expectations. The price impact has shows an over-reaction with some reversal as expected with events generating high uncertainty which have not been resolved but pushed forward. It is expected to have a longer-lasting effect as measured by one-year Eurodollar and Fed funds. This is a classic non-countable, non-measurable event that will harm trend-following managers which focus on measurable, countable, and repeatable events that evolve over time. Systematic funds were caught wrong-footed as measured by the reaction in '40 Act fund performance which provides daily return information. A representative sample shows similar return pattern for the month of May. Gains from trends earlier in the month were reversed in the last two weeks as financial markets rallied on fear and a flight to quality. What can investors do? The only viable option is style and time diversification. 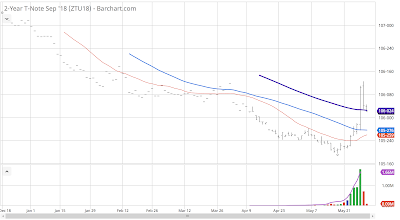 Shorter-term traders may have been able to exploit the reversal. Non-Trend style investors were less impacted by the shock, albeit there was enough spread dislocation to hurt all but the most prescient traders. What keeps me up at night - "The glaringly evident that we have decided not to see"
The table is a short list of issues that should cause concern for any investor. 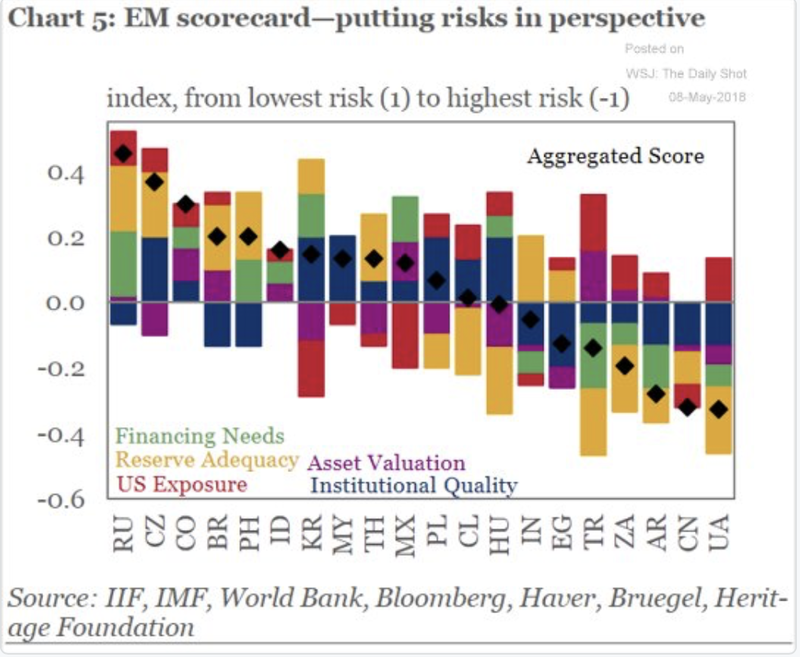 A growing problem is that many are not focusing on the broader return implications for these risks, the chance for contagion and second order effects. Perhaps we have not had the right catalysts to create focus. Perhaps we are being too dramatic in the current risk-on environment, or maybe these are just not really big problems. 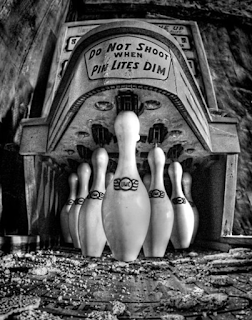 Nevertheless, these issues are keeping me up at night and they have not been given enough weight when measuring the potential return to risk for even diversified portfolios. The benefits from using algorithms are well documented, yet they are still not used for many decision-making situations. The reasons for this lack of use are varied. It could be self-interest. It could be algorithms anxiety. It could be a lack of confidence in the modeling process. If there is a high level of uncertainty concerning the most effective model, there may be fear of being wrong. What we do know is that the more structure to the problem, the less noise or error there will be with any decision. Dan Kahneman discusses the problem when he wanted to use algorithms with a group he was advising on soldier selection in the Israeli army. There was significant pushback from his client, so he came up with a compromise solution of using the set of factors involved with the decisions as a scorecard. The scoreboard of key success factors would be filled out with the final decision in the hands of the client given the factor information. The scorecard or checklist always led to decision improvement that was better than no checklist and almost as good as the algorithm. There may be an effective middle ground approach for any decision-making that would work well for those who do not want to turnover decision-making to an algorithm - a decision information dashboard. Dashboards are being used more frequently in businesses across a wide number of fields. They are generally focused on providing up-to-date information on constantly changing data. This tool is perfect for investment management and can be more informative than a checklist. Bloomberg terminals have been tricked out as dashboards for years, but with new visual displays of information and flexible business analytics tools, dashboards have taken on greater usefulness and timeliness. The dashboards can incorporate the process of an algorithm in an easy to read format. A dashboard can focused on specific decision-making through using graphics and scoring of key variables employed in a specific decision. For example, a simple scorecard on fixed income could include state of the overall economy, shape of the yield curve, momentum, carry, expected inflation, and Fed policy. These scorecard factors could be set to flash red or green based on the score. The set of signals can be aggregated to a fixed income buy/sell score. The decision can still be placed in the hands of the trader, but the likelihood of a noisy decision is reduced since the decision-maker would have to act against the factors that he believes are important for the decision. Mistakes will be made and the dashboard may signal false positives, but the chance of misdirected actions will be reduced. The dashboard could be set actually signal what multiple algorithms would do. The decision-making problem could then focus on disagreement with these algorithm assessments. A feedback loop can be established for any set of decisions, so that the decision-maker's action can be matched with the dashboard score. Dashboards can force discipline on investment decision-makers. There is a problem if the dashboard advice is not taken or proves to be inaccurate, but it is a good way to impose algorithm-lite structure on decision-making. 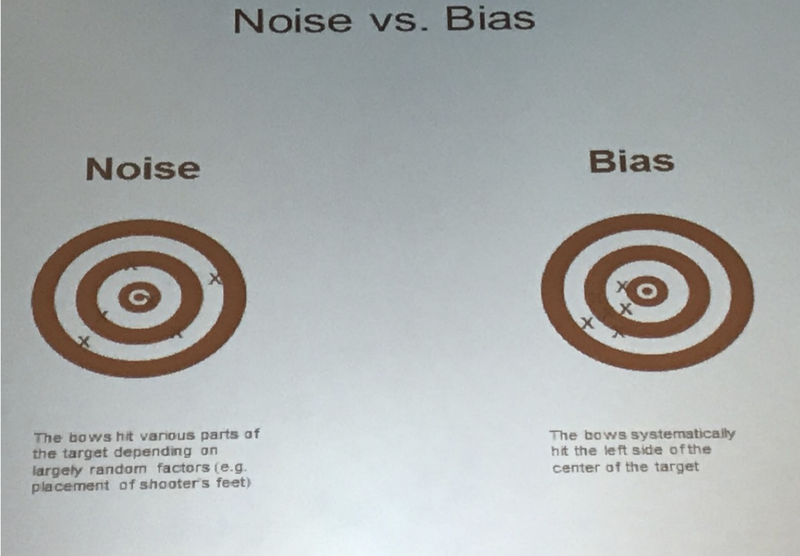 "We have too much emphasis on bias and not enough emphasis on random noise"
There has been extensive discussions about behavioral biases in decision-making. 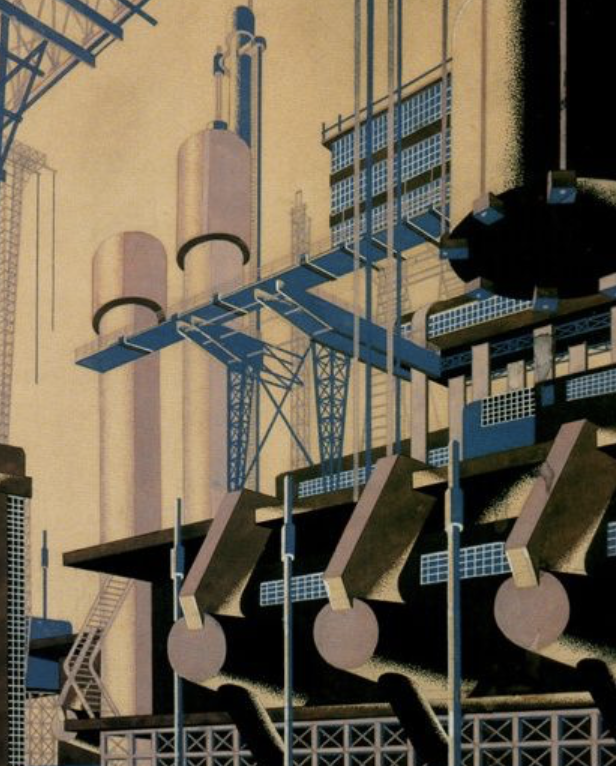 The academic and popular articles on the bias topic are endless and there is a huge cottage industry of finding and cataloguing biases, but are biases the core enemy of good decision-making? Perhaps the bigger issue is noise - the random errors that create decision risk and uncertainty. 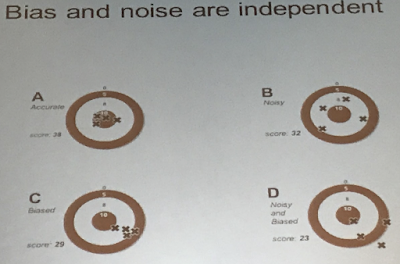 The spread and inconsistency of noise can actual be more harmful with making good decision. 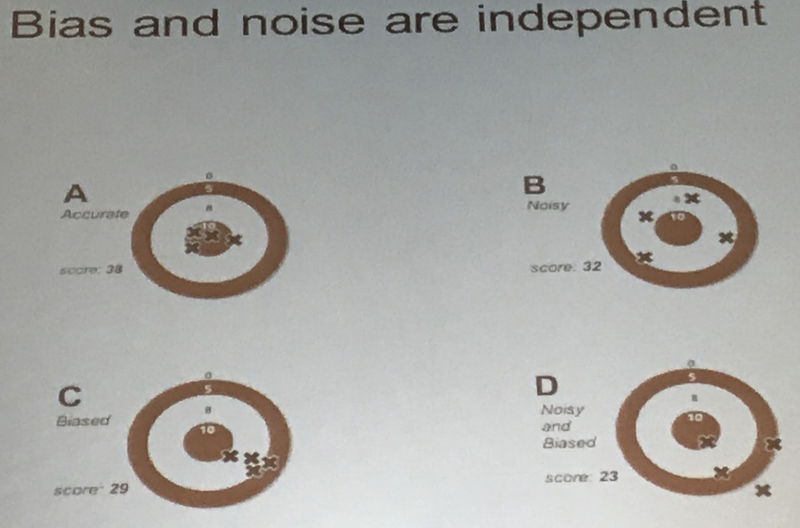 Noisy decision errors are pervasive, but can be reduced. This is the conclusion of Dan Kahneman who certainly has been one of the leaders of the field of behavioral economics. We usually think of noise as measurement error and bias as judgment error but that is an inappropriate dichotomy. Noise is created with our judgment when we don't behave the same for similar decisions. Noise is an invisible problem because we don't believe we can create it. Noise is random, yet it is persistent when we don't follow an algorithm. Algorithms will shrink the noise both for your own decision-making and the across any set of analysts looking at the same problem. There is measurement noise within us. If we are presented the same problem, say rating a wine, our current assessment may not agree with our judgment from a prior evaluation. If we use a panel of wine judges we would not get the same assessment cross-sectionally. There is noise because everyone cannot agree on what is quality. Just think of the noise that is possible if the judgment needed is for something that is especially complex. Kahneman is very direct on the issue of noise. If there is judgment, there will be noise. The noise can come from any number of sources, but it will exist. The core value of an algorithm is its bland sameness when facing a judgment. There will be less noise when we approach a judgment in the same way. 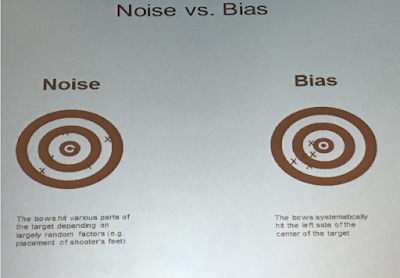 We can identify behavioral biases, but the core problem of noise while subtle is actually simpler. Use repeatable tools to drop judgment error. 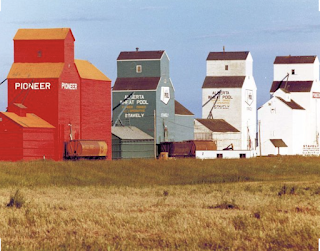 "An algorithm could really do better than humans, because it filters out noise. If you present an algorithm the same problem twice, you'll get the same output. That's just not true of people." "But humans are not very good at integrating information in a reliable and robust way. And that's what algorithms are designed to do." In a recent interview Dan Kahneman talks about the problem of decision noise. When a group of decision-makers are given the same set of repeatable tasks or problems, you would like for them to generate the same answer, yet that is not the case. There is limited consistency with decision-making. Kahneman discusses a research test done with a set of insurance underwriters who are given six sample problems. He believed that there was a surprising amount of noise given the controlled experiment with disagreement about 56% of time. 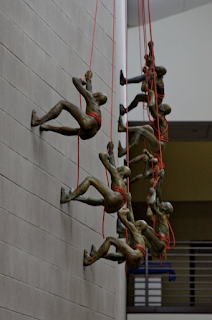 Professionals with the same training and facing the same stylized problem should generate the same answer. That is not the case. Investors may face the same problem. There seems to be a significant amount of noise around decisions that are facing similar sets of facts. Take any economic announcement as a simple case. There is a significant amount of trading volume and thus disagreement on how to interpret the new facts. Perhaps investors always think this time is different. More precisely, investors may be using different models or have different believes that will lead to different conclusions. Reality is only revealed later. This may not be a bias but just dispersion around reality. Investors may be facing too much information that creates a situation for decision noise to exist, (see Pump down the noise - Decision silence). An algorithm will allow for similar reactions to a repeatable set of facts. There will still be error but a repeatable process will shrink the noise and allow for feedback on what may have gone wrong. Ending randomness with decision-making is a positive that can be achieved through using models. 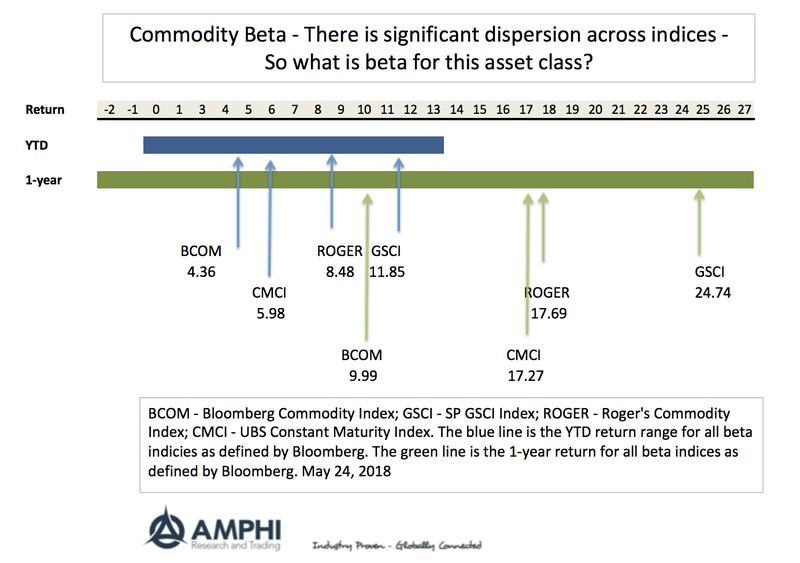 An investor may want to increase his commodity beta exposure to meet his strategic allocation target for this asset class. Unfortunately, all betas are not created equal in the commodity space. There is a wide difference in the choices that are available and this chasm is much greater than anything found in other asset classes. Investor may not be able to get to smart beta because there is little agreement on just plain beta. If you ask someone what is the beta benchmark for equities, the answer is easy, the SP 500 index. For bonds, the answer is the Barclays Aggregate Index. An investor may choose a different benchmark, but there is almost universal agreement on a base index. 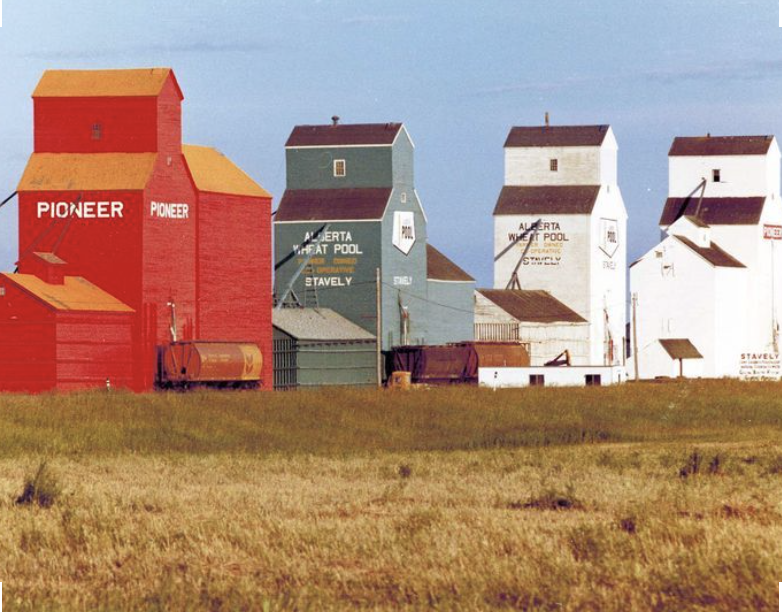 This is not the case for commodities. Given investor luck, whatever benchmark is chosen, it is likely that another will do better. The chart above shows the range of returns for commodity beta based on the broad definition used by Bloomberg. This range includes a fair number of what may be called smart beta approaches to commodity investing; nevertheless, we highlighted four basic passive long-only commodity indices that have been actively used by investors. The BCOM and GSCI would be the most popular. The GSCI will have a higher energy allocation than the BCOM. For 2018, the differential between the two leading indices is over 700 bps while the difference for the last year is over 14%! Picking the wrong benchmark will have a significant performance difference for that asset class bucket. There is no simple solution to this problem. Averaging more than one index is possible but does seem to be a satisfying alternative. 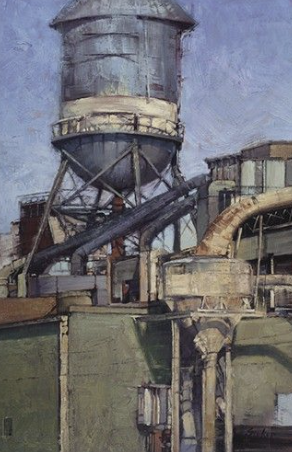 Hence, making the simple decision to have some commodity exposure is actually much more difficult than would be the case in other asset classes. The reason for asset allocation scenario analysis is simple. There is a whole crowd of investors who do use or are uncomfortable with formal decision-making employing optimization. 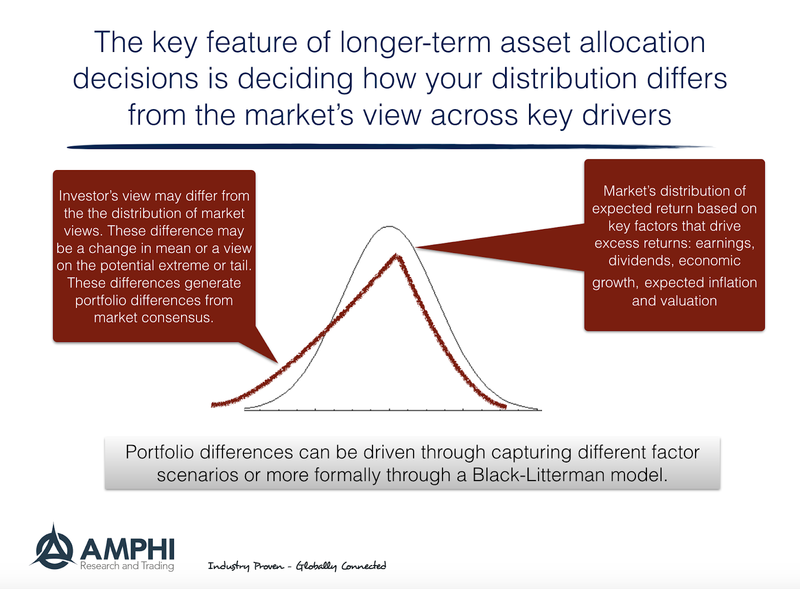 Quantitative asset allocation models like Black-Litterman, while elegant in theory, have not caught-on with many who are on the frontline of asset allocation work. Running scenario analysis provides a useful thought experiments tool to help refine asset allocation choices. Many large Wall Street sell-side and buy-side firms will provide long-term excess return forecasts for clients. These will usually be a combination of a number of simple factors like growth, inflation, valuation, earnings and dividend yield. These factors are rolled-up to a point estimate for the long-term expectation that can be used to help with long-term asset allocation decisions. 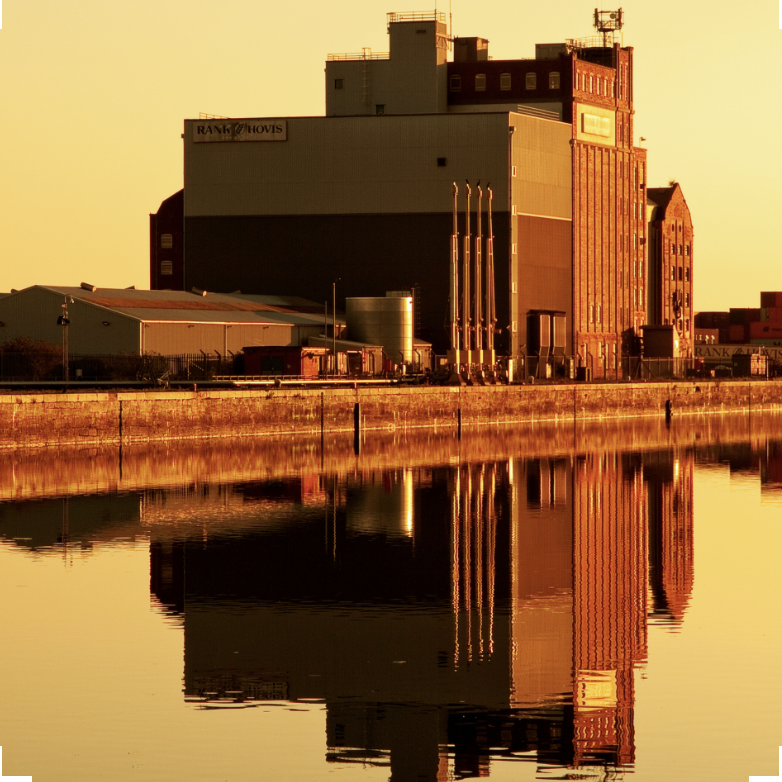 There are ways to extract more value from these forecasts through using scenarios analysis with confidence assessments on the component factors to generate alternative asset allocations. Scenario analysis provides a quick way to assess alternatives. An asset allocator can compare his underlying factor expectations and confidence against the market's estimates and form alternative allocation choices for different scenarios. Factor inputs for your long-term expectations can be given different weights or level of confidence than the market view. 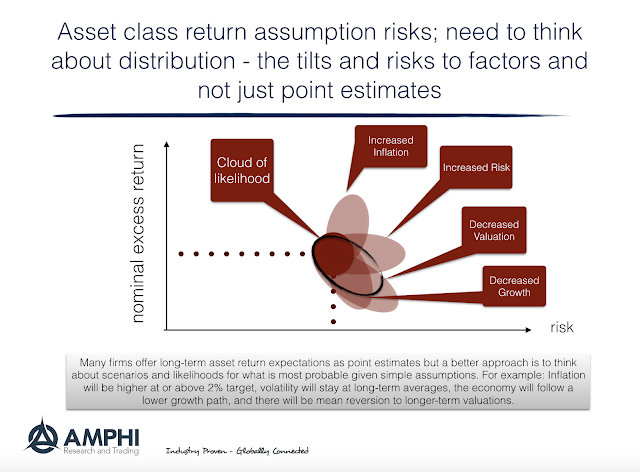 These differences in estimates for the underlying factors can then be incorporated into different asset allocations which can be given some likelihood. Running comparisons of your own subjective market forecasts against the market's view is not novel, but it can be an extremely useful exercise for identifying risks and reasons for portfolio tilts. What would be your bond return expectations if long-term inflation were greater than the market consensus of 2%? How much confidence do you have in a greater than 2% inflation forecast? If you believe there will be a higher inflation number, what would be the portfolio you would create relative to a current benchmark? Do you believe current stock valuations will continue? If stock valuations normalize, what will do you believe will be the impact on expected equity returns? How will you adjust your portfolios relative to a benchmark or the market consensus for valuation? Scenario analysis can show the impact on asset return and risk from your subjective views versus the market's view. If this is done on a factors basis with confidence weights, investors can generate the overall impact of their views on potential return and risk. We have found that there is an effective middle ground between optimization and ad hoc use of point estimates for asset allocation decisions. Albeit a second best solution, scenario analysis, if done right with some measure of likelihood with respect to alternatives can be a useful informative tool for investors. The average correlation across stocks (intra asset class) has important implication for portfolio construction and for active management. 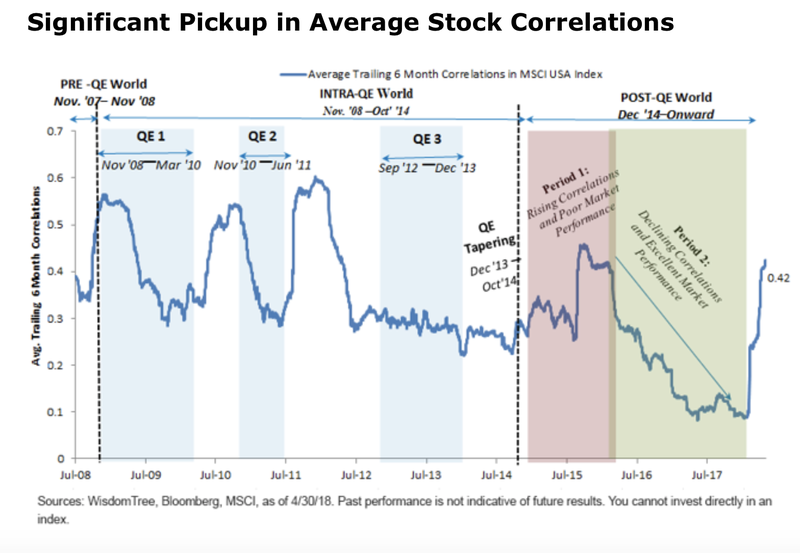 The chart below from Wisdom Tree shows average stock correlation since the Financial Crisis. It has been subject to sharp increases followed by declines. Our general view, consistent with this data, is that if there is a single factor macro event, there will be a corresponding increase across all stocks. There is a an ebb and flow of macros events which affect the amount of any factor explaining stock variation. It does not have to be a negative event. There has to be a singular event that is perceived to impact all stocks. QE1 and QE2 were these types of singular events. The Taper Tantrum was another as well as the anticipation of the end of QE. Finally, the volatility shock of February 2018 was the most recent and perhaps the most severe. Events that will affect all stocks will increase average correlations. It is clear that when correlation goes up across stocks there will be a corresponding increase in implied option volatility for stock indices. There is less stock diversification within the index, so there is a impact on the index volatility. Additionally, the uncertainty and its resolution concerning a macro event will add to the overall index volatility. There is a need even for stock pickers to have a macro view or have an appreciation for the changing correlation from macro events. For portfolio construction, picking alpha generator managers within equities may lead to heightened risk from correlation spikes. This risk requires diversification in to strategies that may focus on macro events. - Credited to William Bruce Cameron instead of Albert Einstein from Cameron’s 1963 text “Informal Sociology: A Casual Introduction to Sociological Thinking” although it was supposedly written on a blackboard by Einstein. There are event that can be imaged and can occur but cannot be counted. First, there are events that have not yet occurred. Second, there are events that do not occur often enough to create a meaning full count. For some this is the need for imagination. For others we call this the need for narrative. Others can call upon scenario analysis to address this shortage of counts. The fact that there is a need for non-countable thinking means there is a role for narrative and story-telling. This is the place where the science of finance ends and the art of investment begins. Nonetheless, this grey area between quantitative analysis and narrative is an uncomfortable area for investment analysis. A pure quant strategy leaves itself open to problem of dynamic behavior and swings in sentiment. Leaning to far into the area of narration creates an investment process that is not repeatable or measurable. Wisdom in investment management comes from the experience of knowing what to count and is countable against knowing what should not be counted and should be subjective measured against theory or specific events. The storytelling and narrative is on the surface easy, but hard to do well. 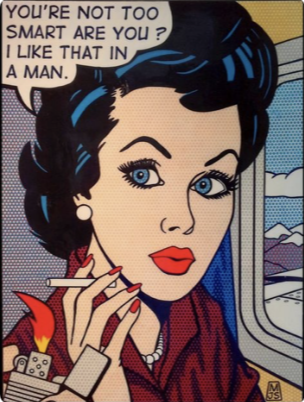 Most like to hear and tell story although the action within the narrative is often ambiguous. 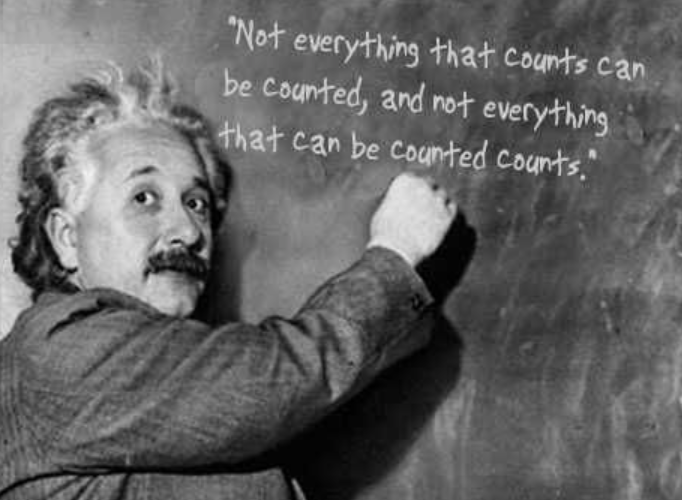 For most investors following the count is better albeit harder to implement. 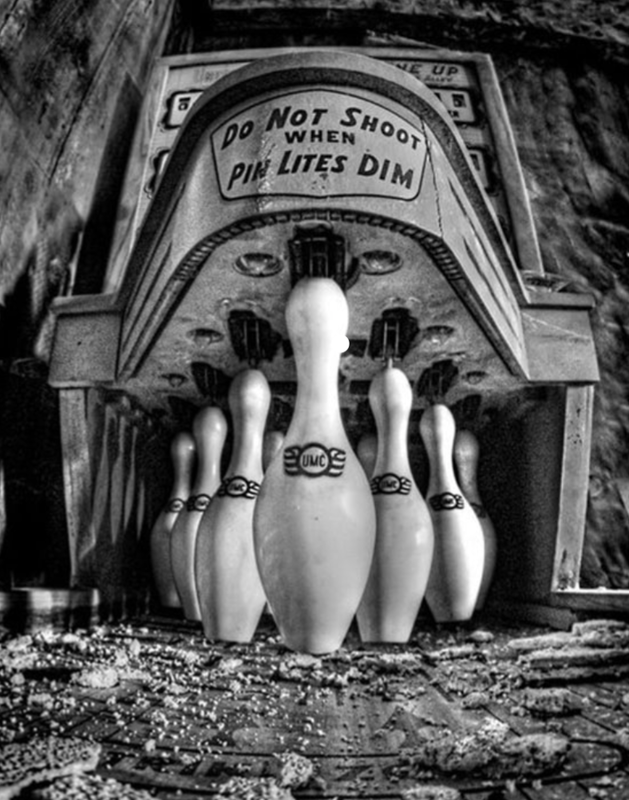 It forces rules and measurement for dealing with a risky environment. A perfect process will blend counting with narrative. Emerging market stocks and bonds are facing difficult times in 2018. 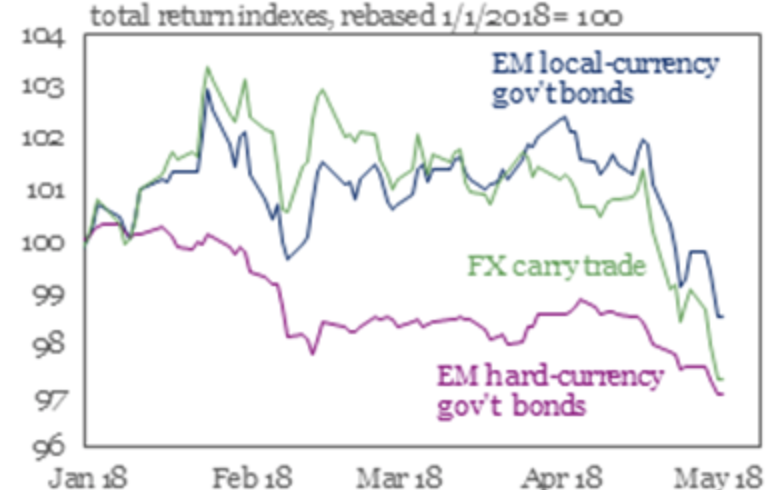 Emerging markets may have looked like potential outperformers at the beginning of the year, but they have now fallen below respective US stock and Treasury indices. 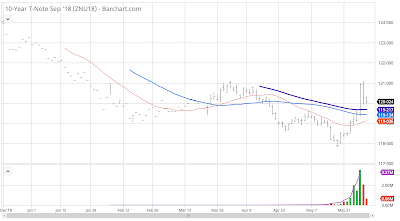 This sell-off has been further enhanced by the negative economic events in Argentina. Higher volatility, rising interest rates, and a refocus on core fundamentals are all affecting investor outlooks for EM investments. Perhaps EM is reacting to a new "taper tantrum". With the Fed raising rates and starting to sell balance sheet, credit markets are starting to adapt and adjust to a new monetary environment. Regardless of forward guidance or the level of gradualism, the impact of Fed policy is to taper the liquidity of the past. Is the reaction a tantrum or just the likely response to this change in direction? The reaction to declining performance and what is perceived to be a more difficult fundamental environment is as expected. 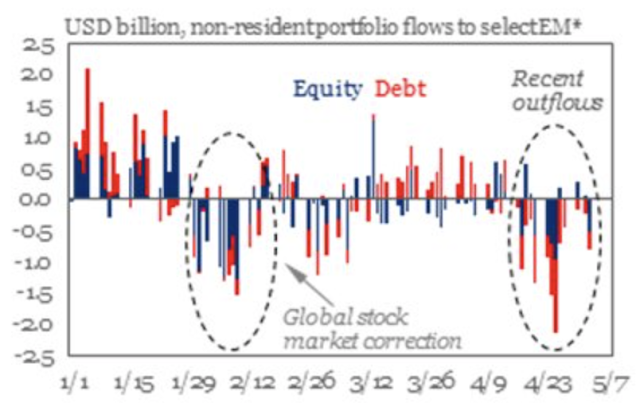 EM flows for both equities and debt have clearly been negative. These outflows place pressure on currencies as well as debt and equity markets. 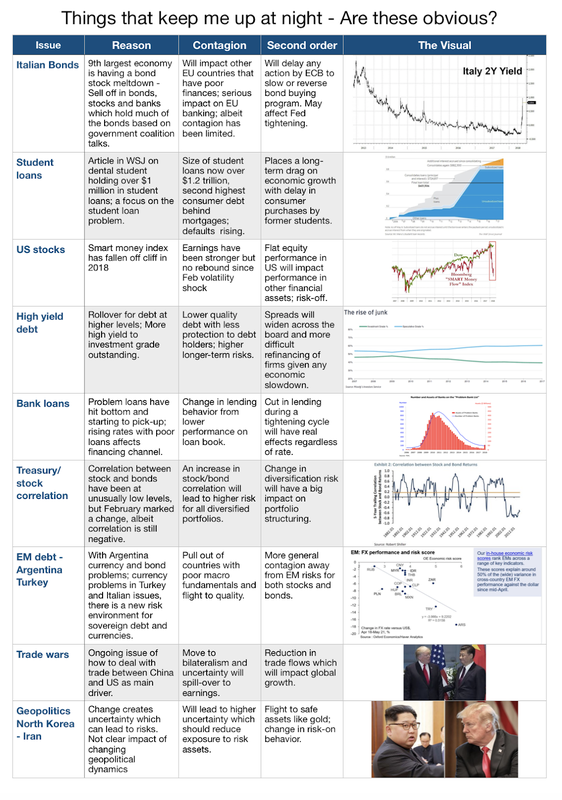 Charts are from IIF blog/twitter. The earlier positive outlook for EM was driven by better growth prospects, but rising rates have dampened growth momentum in the past. The above trend growth in both emerging and mature markets will not last as growth will respond to the higher effective Fed funds and general reversion to the mean. 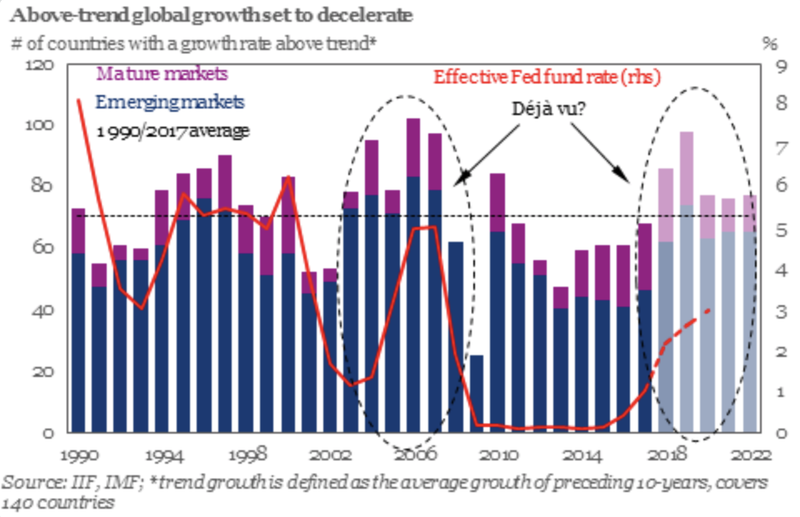 Fed tightening usually translates into lower forward growth rates with a lag. Given a potential decline in liquidity, specific country scares like Argentina, and a reversal of trends to the downside, there is a flight to quality with EM. Those countries will poorer growth, credit, and current account deficits, will see stronger deterioration. This situation becomes scary after a review of the composition of the cross-border debt. The US has an especially strong allocation to emerging and frontier markets versus other countries. 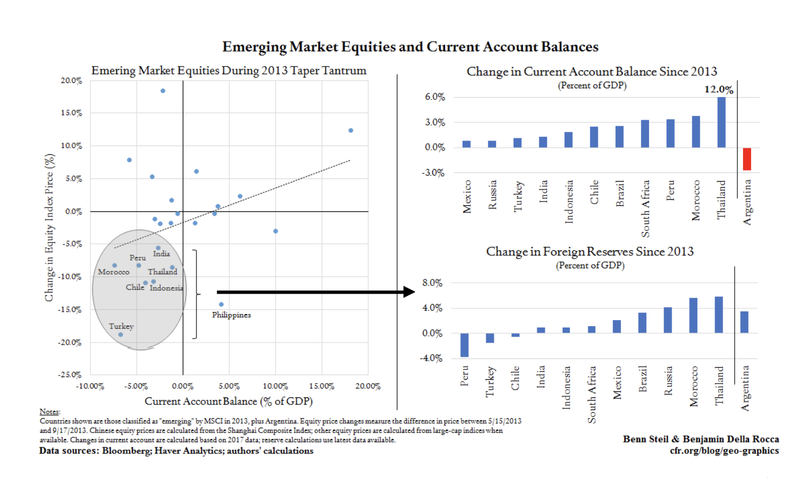 If there are further EM declines, US investors will more likely be harmed. 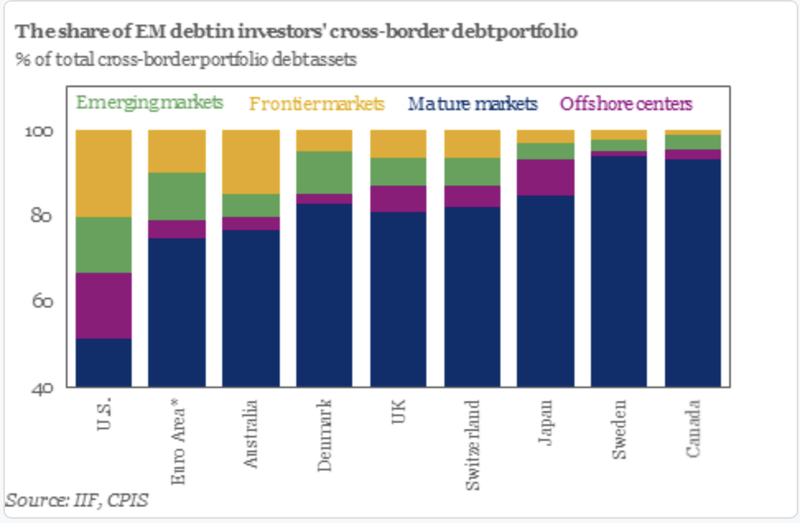 Additionally, the ability of EM countries to weather this sell-off is made more difficult by the fact that EM borrowers have an increasing amount of debt that matures in the next few years. While there have been strong advocates for long-term EM investing, rising US rates is a good time to review the quality of the holdings. After a country shock like Argentina, there are usually two reactions. First, there is general reduction is exposure to EM. Second, there is a new focus on fundamentals. This is the time to rebalance based on stronger credit, current accounts, and macro fundamentals. We have seen this story before. Fed raises interest rates and credit starts to tighten, even if it is on a relative basis. Money flows out of riskiest alternatives usually when there is catalyst negative event, and portfolios are restructured to find safer alternatives. The size of the sell-off or the amount of restructuring may differ this time, but an end of EM herd behavior starts the break-up. Start with a simple return to risk of .3 for one asset and start adding asset classes that have the same return to unit of risk but different correlations. 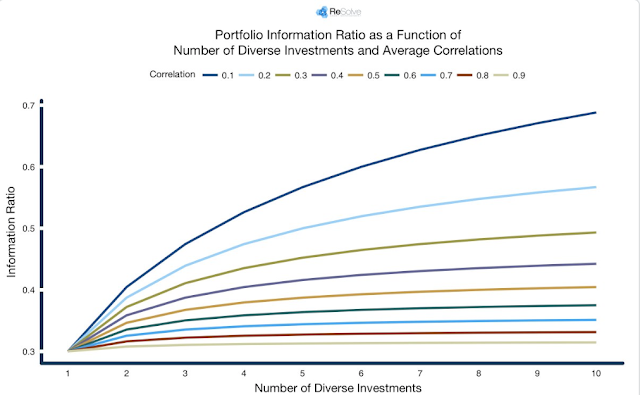 The power of diversification is explosive when correlations are low. There is nothing to get excited about if there is high correlation across assets classes, but it should cause any investors or portfolio manager to jump out of his chair if he starts adding in low correlation assets. You can literally double your information ratio if you can added those low correlation (.1) asset classes. One of the great portfolio advantages with adding hedge fund strategies and alternative risk premiums is that these strategies will have lower correlation against core equity and bond indices and thus will provide strong improvement in information ratios. Hedge fund strategies allow for more "free lunch". Financial conditions are not suggesting stress - Be optimistic? The Office of Financial Research (OFR) Financial Stress Index is not showing any signs of a problem in financial markets albeit conditions worsened in February. 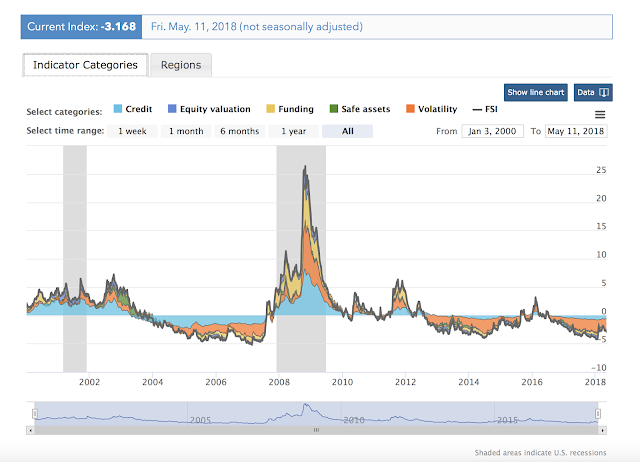 It is notable that all sectors, credit, equity, funding, safe assets and volatility are closer to post Financial Crisis lows than the spikes in 2011 and 2016. Of course, the construction of the OFR stress index only includes financial spreads or price information and no fundamental information. Prices may lead economic financial stress and can be a cause of stress but it does not tell us about the drivers of financial pricing. Financial condition indices from Fed banks have not shown a return to the lows at the beginning of the year. These indices overlap with the many of the components of the OFR index but have different weighting schemes as well as different components. The Chicago Fed Financial Conditions (NFCI) Index has the broadest set of data and also uses macroeconomics adjustments for their ANFCI index. These broad indices show a similar pattern to the other stress indices. 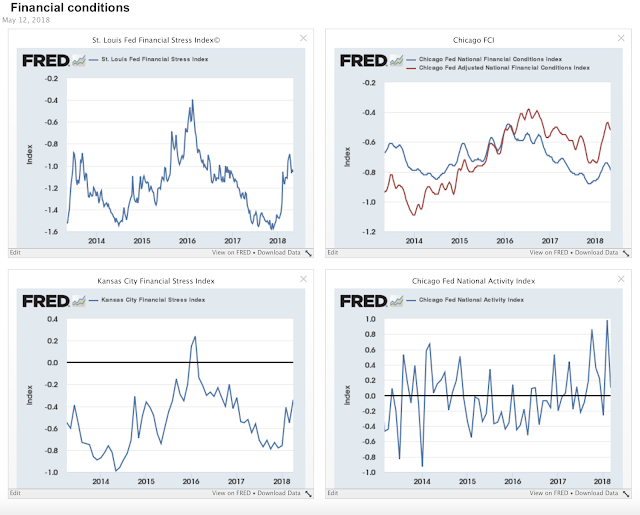 The Chicago Fed National Activity Index has increased in volatility and has failed from highs but still is in positive territory. The financial conditions have been tame for almost eight years except for a period between QE's in 2011, the Taper Tantrum, and early 2016 after the end of the Fed zero interest rate policy. While the volatility spike from February has not been reversed, stress levels suggest market calmness. 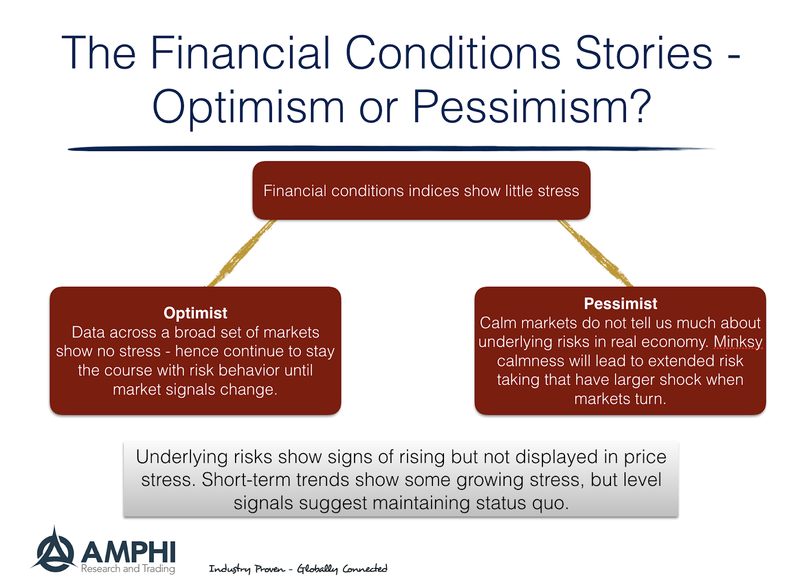 Market concerns and risks may be on the rise, but these concerns have not yet been displayed in financial price relationships. I have been one of those "if you cannot measure it, you cannot manage it" types. Most quants are like this, but there are limits to measurement or trying to fit qualitative characteristics into a measure. Difficulty does not mean that attempts should not be tried. Most will admit that measurement is very useful in some areas of study but have to be more tempered in others. Jerry Muller, in his book The Tyranny of Metrics, explains the potential problems of a culture that focuses too deeply on measurement. This is a good counter to the always measured to manage crowd. The author describes measurement and gaming problems with colleges, schools, medicine, policing, the military, business, finance, philanthropy, and foreign aid. It is everywhere, so every analyst should appreciate the problem of measurement. You will be gamed. Measurement changes incentives. You will measure the wrong things. Use your numbers, but beware of your numbers. How do you classify global macro firms? There are a wide variety of hedge funds that call themselves global macro so a classification scheme may help distinguish possible return patterns. One simple method is through the type of information used and the decision-making process employed. Information usage can be either restrictive or broad-based. A restrictive information usage framework could be limited to only price data. This is the focus of trend-followers or those that look at cross-asset spread relationship. A broader-based set would use fundamental information from a wide variety of sources. This could include monetary and real economic data. The other dimension for global macro classification is through how decisions are made given the information provided. Decisions could either be systematic or discretionary. Both may be disciplined and have rules, but the systematic approach will have a direct mapping from data to action while the discretionary approach may be more situational or flexible on all possible actions. If this 2x2 framework is employed, it is easy to see where there is concentrated global macro behavior. Quadrant II will be where most trend-followers spend their time. The classic global macro managers will either be in Quadrant III and IV. These managers will differ on the amount of information employed. What is missing are global macro managers which fall into quadrant I. In this quadrant there is wide use of information, both price and fundamental, and systematic decision-making. This approach should have a smoother return profile relative to trend-followers and may react differently than discretionary global macro managers. You will not find many of these global macro managers. 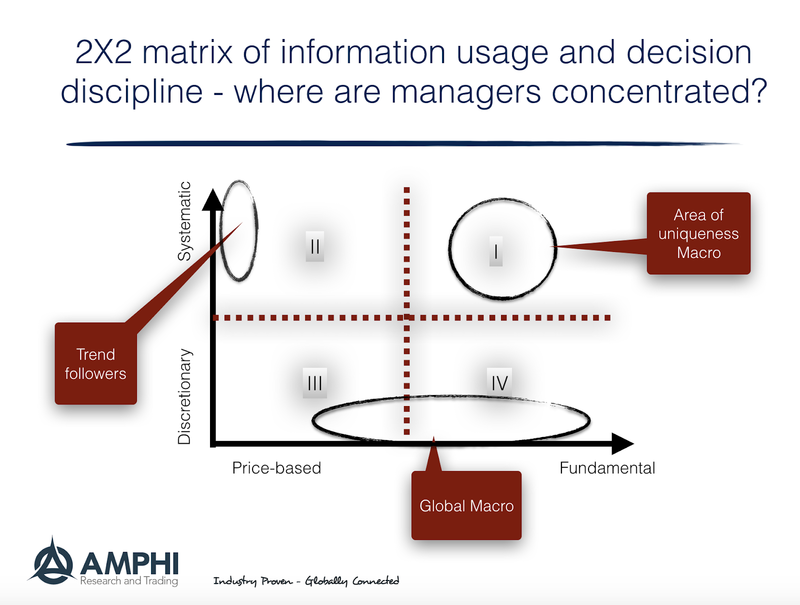 This is not the only way to think about classifying or separating the difference in global macro managers, but it provides a simple approach on two useful factors. By this classification measure, global macro investors should keep a look-out for quadrant I managers. A focus of global macro investing is looking for general factors which can have an impact across markets and countries but are displayed slowly in cross-asset relationships. Macro traders watch closely global and local financial conditions such as monetary liquidity as good indicators for potential switches between risk-on and risk-off environment. They also look for changes in credit conditions as a signal of potential shocks across local financial markets. 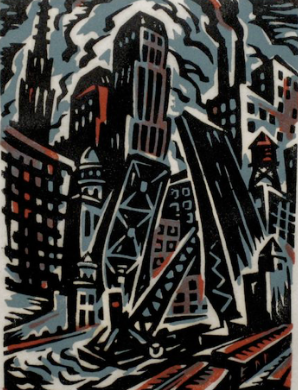 Research has found that the Financial Crisis was worsened by the high level of international synchronization especially in credit growth prior to the fall in 2008. The large fall in real and financial activity that was related to a global liquidity shortfall. Liquidity shortfalls will have not only real effects but also impact investor and consumer sentiment. 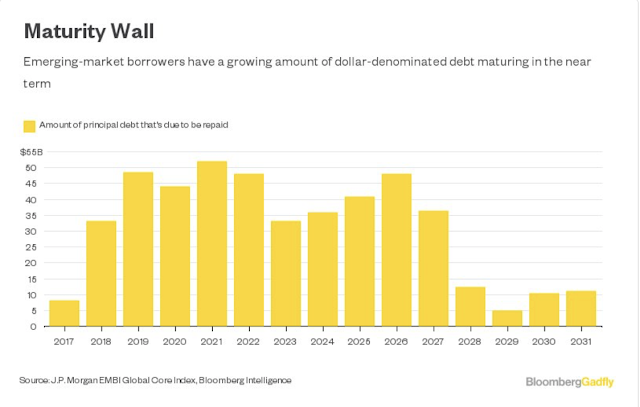 Tightening credit spills over to investor pessimism. 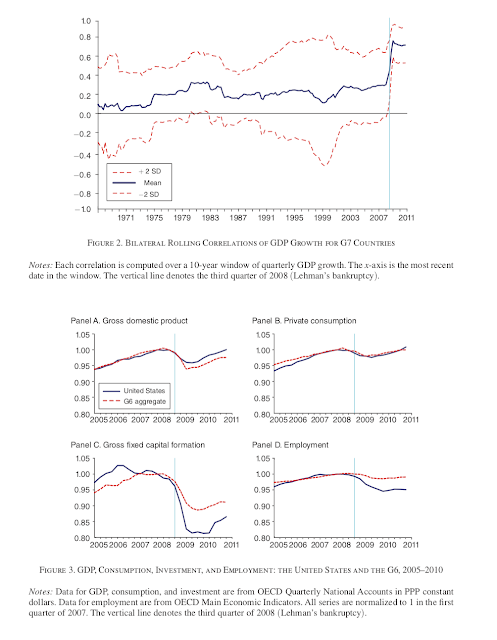 (See Fabrizio Perri and Vincenzo Quadrini "International Recessions" American Economic Review 2018, 108(4-5): 935–984.) 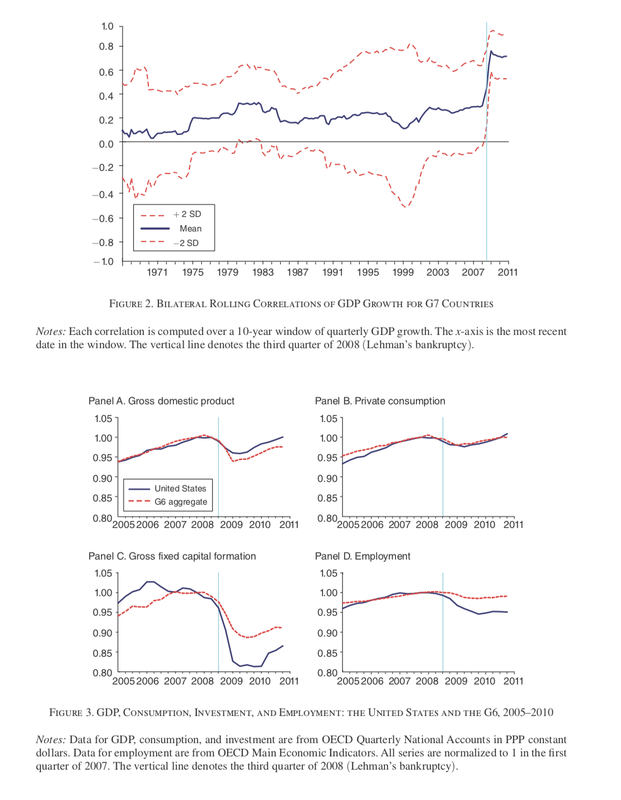 Their charts of the Financial Crisis show the growth correlation between G7 countries and the similarities in macro behavior. What is clear is that the high correlation was preceded by the downturn in credit markets. 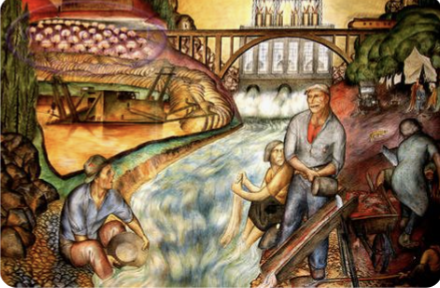 Financial integration means that local liquidity shocks may have less impact because capital can flow from other sources, but when there is a global crisis the impact will be more synchronized and severe. 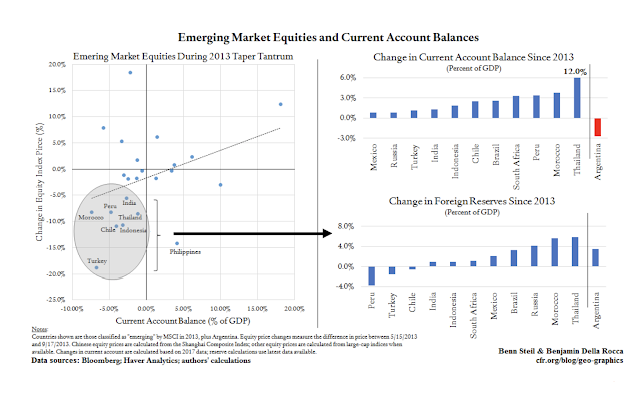 Hence, following global liquidity is key to tracking potential tail risks in financial markets. Financial integration means that we get less diversification from holding international equity and bond positions. When there is a negative shock, investors are nothing to get the diversification desired or expected. While following the Fed is a necessary starting point for global liquidity monitoring, the behavior of all large central banks have to be integrated to get a good picture of global liquidity. The integrated approach means that Fed rate rising has not spilled-over globally because other central banks are continuing to provide liquidity. The current key liquidity consideration is what will be the actions of the ECB, Bank of Japan, Bank of China, and Bank of England. Most investors cannot clearly articulate why investment management is so hard. There is the superficial response that it is hard to beat a benchmark, but there is less discussion on why. Of course, costs are very relevant but the difficulty is also associated with the environment faced by investors. A deeper meta-view for how the financial world works is needed to help describe the risks and challenges of investing. 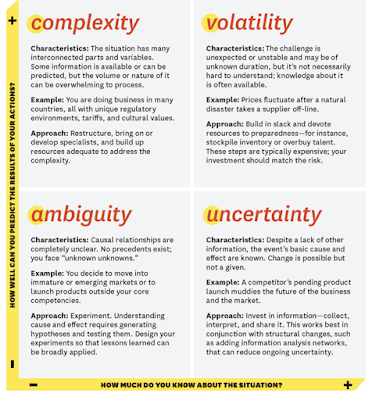 There is an expression that is used by the US Army to describe battlefield conditions or strategic environment for planning - VUCA, (Volatility, Uncertainty, Complexity, and Ambiguity). VUCA more aptly represents what investors face. This acronym is far more descriptive than the Clausewitz idea of a "fog of war" and serves as a good starting point for describing the investment world and the difficulties faced when making decisions. Investors live in a VUCA world. 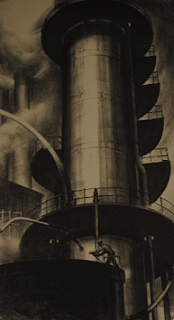 The VUCA description for the environment provides a richness concerning the investment problem that is not captured with just saying that investors are faced with higher volatility or that there is a chance for black swans. Volatility tell us the behavior of prices, but does not tell us much about the decision problems we face navigating the investment environment. It is highly important and relevant as a measure of risk but it does not tell us what may cause the environment to be more volatile or why risks may increase. Saying that black swans may occur and that we will be surprised is all true, but does not provide insight on why we may be unprepared for these unknown surprises. Describing the environment as VUCA provides more nuance on the type of risks faced by investors. It incorporates both the measurable within volatility and the subjective and not easily measured or countable with uncertainty. 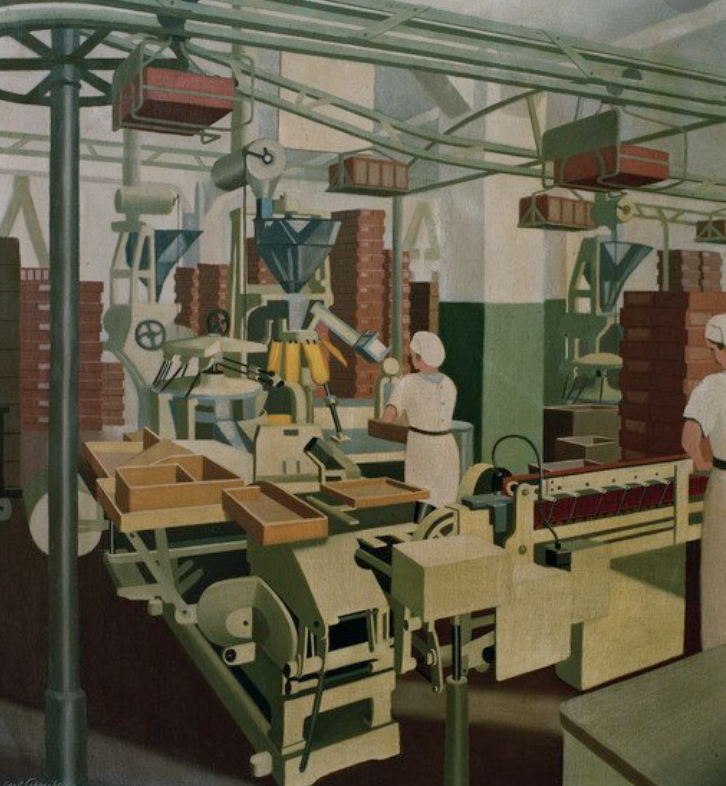 Complexity tells us something about whether the investment environment can be simplified or easily described while ambiguity provides a description on that which cannot be easily modeled. Ambiguity tells us that there are competing models that can both explain the facts but cannot all be right. Complexity tells us that no single factor or small set of stable factors can explain the variation in returns. We are now seeing this concept of VUCA incorporated in broader strategic planning. 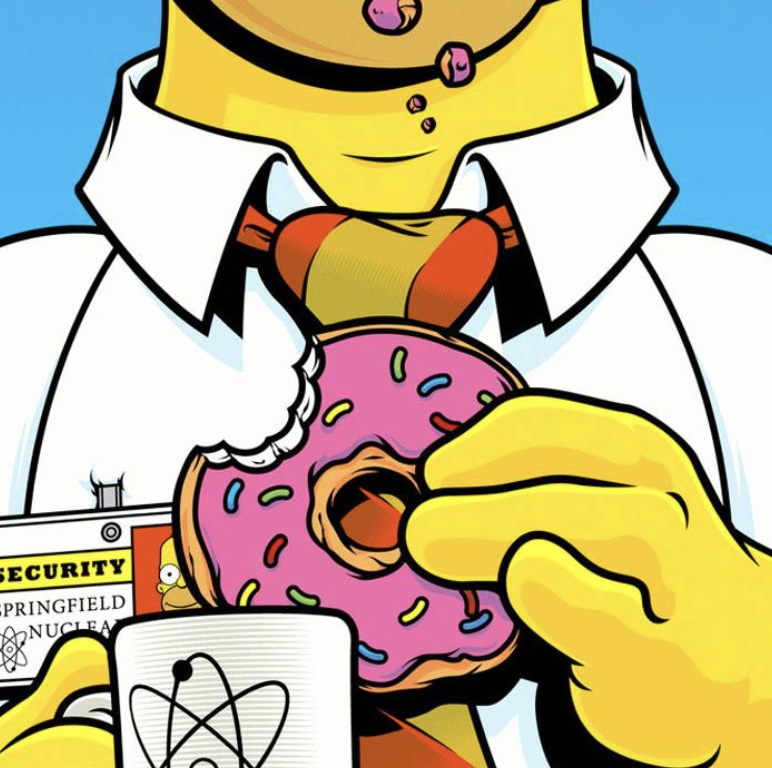 (See Harvard Business Review, "What VUCA really means for you.") 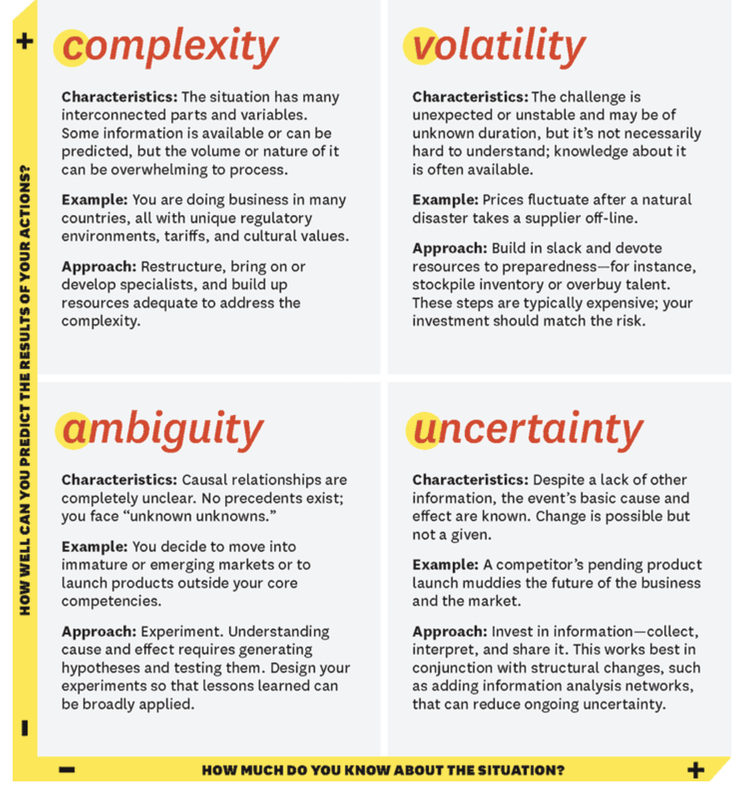 I am not comfortable with the definition applied to VUCA in this case given the focus is on business strategy and not the investment environment, but the table does highlight some of the key points that investors need to think about within a VUCA framework. VUCA focuses on the idea that there are two dimensions to strategy problems: how much do you know about a situation and how well you can predict the possible results of your actions. This ties knowledge with results in a way that most investors do not usually frame. 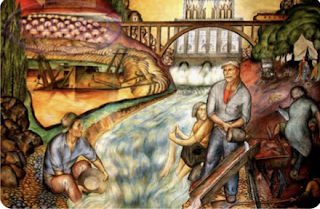 The VUCA framework for describing the investment environment needs to be further operationalized, but it does provide a good starting point for discussion. Talent and costs are key drivers for investment success but they are limited by the environment faced. 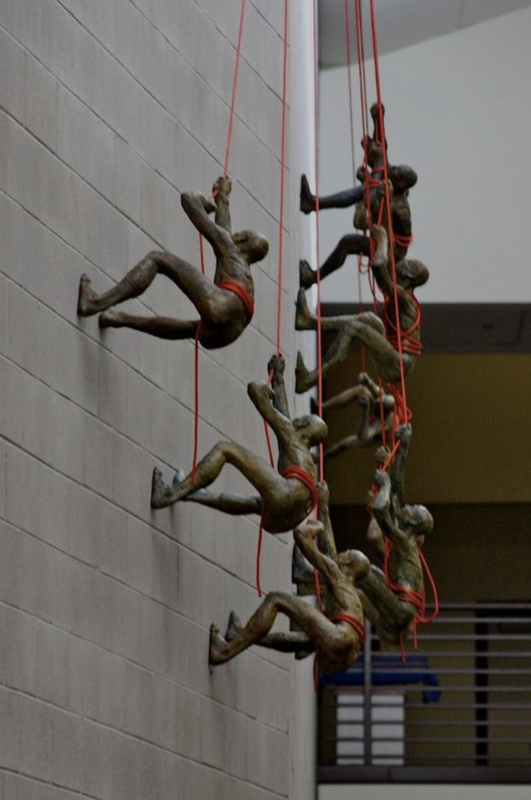 In a more ambiguous, uncertainty, and complex environment, success is more difficult to achieve but is also more likely for those that are prepared. I have been studying the impact of futures on cash markets for decades, so I was very interested in the new short piece of research, “How Futures Trading Changed Bitcoin Prices” FRBSF Economic Letter 2018-12 May 7, 2018 that was published this week. I have been watching the development of bitcoins, but I don't partake in bitcoin trading. If pushed into a corner for an opinion, I would say that bitcoin trading is excessive and overly speculative. Bitcoins as a concept may have exceeded its reality. It also may be too early to have trading of a derivative on this cash market with many outstanding questions on how to best run this market. Nevertheless, now that futures trading has begun, we should study how the bitcoin cash market may or should change. This recent research, however, is a good poster piece on the fact that correlation many not mean causality. Bitcoin prices have fallen since the inception of futures trading, but that does not imply that futures were the cause. It could be, but it has not been truly tested. If careful research is not done on this topic, then emotional biases will drive the discussion and not facts. The authors show no understanding of the role that futures markets have played in increasing the efficiency of cash markets. More importantly, they have no sense of the rich research history on the impact of futures on cash markets. There is little structural discussion on the role of futures to complete markets when there are high costs for shorting or trading in general. Nor was there extensive discussion on the role of price discovery through futures markets with the authors only paying lip service to recent work on financial innovation. Perhaps more research is pending, but there is little evidence to make any strong judgments on the value of futures trading to control the excessive prices seen in bitcoins. There is a need to understand the impact of futures on a fragmented cash market where the pricing is based off a reference index which may not be inclusive of all trading. Futures have proven in most markets tested to increase market efficiency, dampen volatility, and improve market transparency. There are clear structural and regulatory advantages from having trade done on a transparent exchange. Futures play a significant role in the financial system and not fully defining, reviewing, and testing of how this role is played is a disservice to the futures markets and all those who rely on the Fed to provide useful information and research on any policy debate.